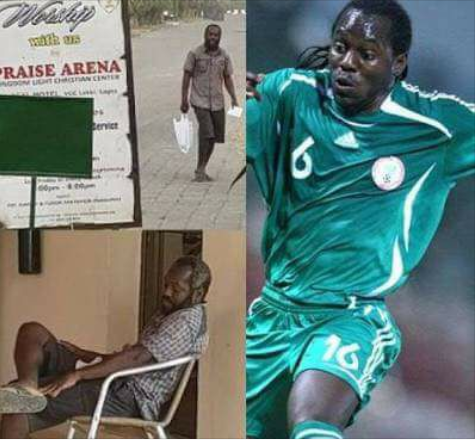 It has been revealed that Nigeria Football Federation, NFF President, Amaju Pinnick and other football body stakeholders in Nigeria have joined hands to make sure that ailing ex-international, Wilson Oruma get back to his feet, after it was reported that he was seen roaming the streets of Lagos following a brain disorder which he suffered after being conned a whopping N2billion or more of his life savings. According to him, “About three weeks ago, the plight of Wilson Oruma was brought to my attention through pictures of him posted roaming the streets of Lagos by former AFN President, Mr Dan Ngerem. Pronto, I set up a committee of like minds that included Mr Ngerem and a few other friends through Family United By Sports (FUBS), the whatsapp platform that I am privileged to administer to see how we could assist him. We got in touch with his family, the NFF and a few others. I as write this, Wilson is enjoying the best of medical attention in a private hospital in Lagos courtesy his family. It is no longer news that he was duped through friends he trusted to the tune of over N2billion or even more. This led to depression because he lost all his life savings. Any man would’ve been depressed. l with specialist doctors assigned to him, one is from Europe. Also, the NFF will have an award ceremony in a few days and Wilson will play a big role during the event. Truth is, he’s fine and relating well with everyone. Come June, this year, Wilson will be going to the World Cup in Russia as an Ambassador of the Super Eagles of Nigeria. I enjoin all to thank Pinnick and his 1st Vice President, Barr Seyi Akinwunmi who has visited Wilson in hospital many times and the reports have been very encouraging. Good news is that Wilson Oruma is responding to treatment very well. Once again, the family is pleading with Nigerians not to give money to anybody or group of persons in the name of supporting Wilson Oruma because he doesn’t need money at this point but medical attention and our prayers. The family has also distanced itself from a charity game planned by some people to raise money for him. This according to Dominic Oruma, is part of the plans by same people who ripped him off to continue to make money for themselves. Wilson Oruma, is a former football midfielder from Nigeria. From Warri, the ex-internaional played alongside, Nwankwo Kanu, Jay-Jay Okocha and others.